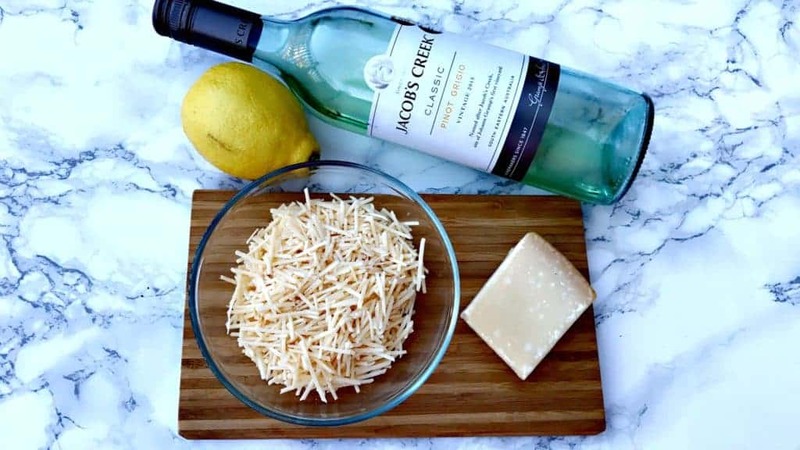 Low-Carb Shrimp Scampi with Zucchini Noodles and Parmesan is just on time because I am so in love with my Shrimp Scampi Dip recipe. 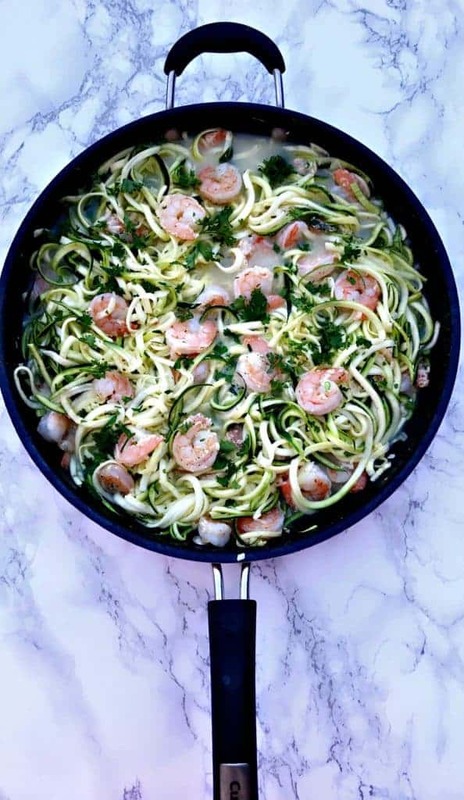 I decided to turn it into a healthy shrimp scampi zucchini noodles dish. 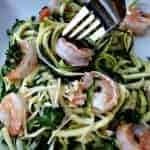 Zucchini noodles are a great way to put together a low-carb dish that still packs a lot of flavor. I had the majority of the ingredients left over from when I made the dip. I purchased the zucchini and whipped up a great substitute. 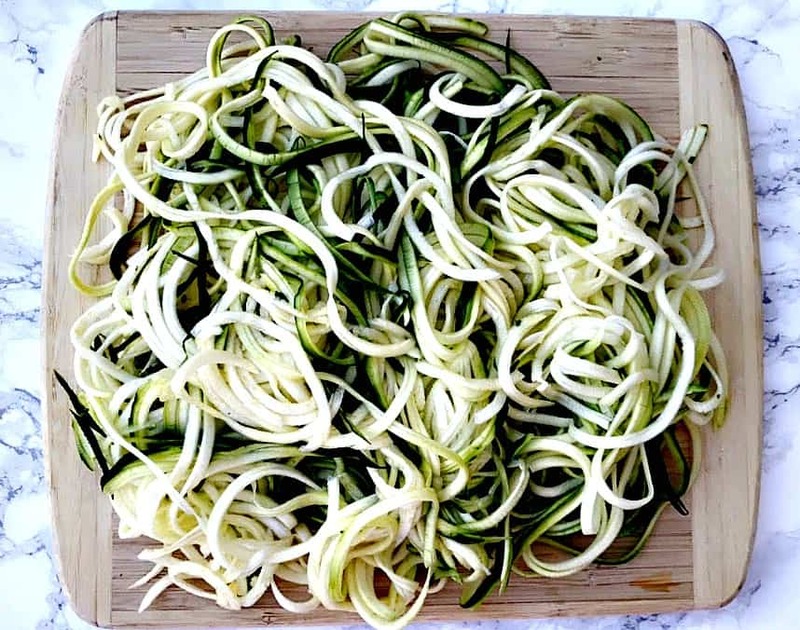 Zucchini noodles can be a great substitute to save carbs in pasta dishes. They are low-carb and great for keto and paleo diets. However, zucchini noodles do not have the same texture as pasta. I get this question a lot. The answer is no, but I do find it to be a very tasty substitute. 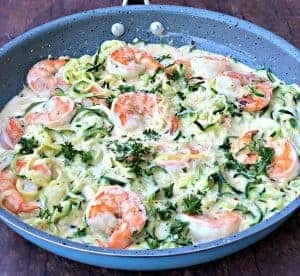 Low Carb Shrimp Scampi with Zucchini Noodles and Parmesan is a keto dish prepared with spiralized veggies (zoodles), white wine, and drenched in olive oil. Heat the olive oil and butter in a skillet over medium-high heat until the butter is melted. Add the shrimp, cook for 2-3 minutes, flip to cook the other side. Add the garlic and red pepper flakes and cook until the garlic becomes fragrant. Add the white wine, broth, and lemon juice to the pan, simmer for 2 minutes. Add the zucchini noodles and cook until soft for about 2-3 minutes. Add the lemon zest and parsley, stir and toss. 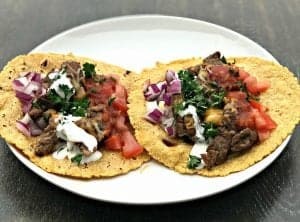 Need Keto Recipes for the Summer?Access our 21 Day Summer Meal Plan here! 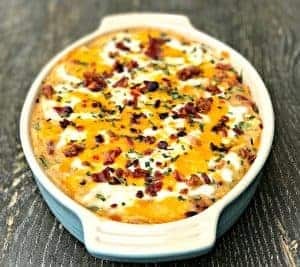 Need help planning keto friendly meals?Grab your 14 Day Keto Meal Plan here.! 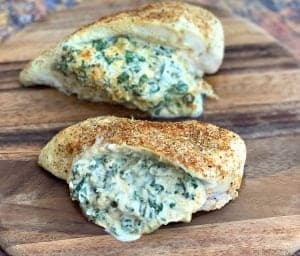 Looking for new ways to use your air fryer?Snag your 14 Day Air Fryer Meal Plan here! Tried this recipe?Mention @Stay_Snatched or tag #StaySnatched! Wanna Be the Boss of Your Instant Pot?Check out this Instant Pot Video Course! This dish is so gorgeous! 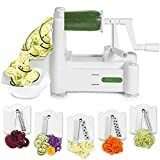 What spiralizer to you use. My son got me one for Christmas a few years ago but it’s so small I can barely use it for carrots! This looks absolutely delicious and I love the zucchini noodles. 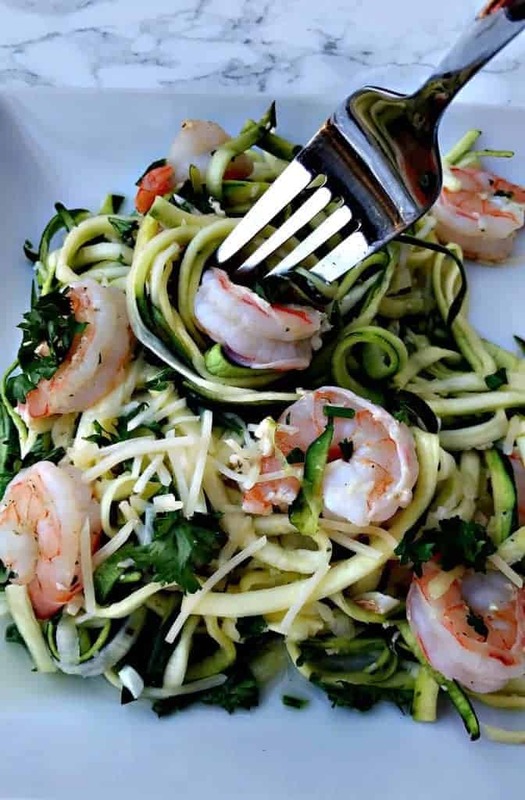 I’m such a fan of zoodles and have been on a huge kick of shrimp lately so this is right up my alley. Can’t wait to try it! This looks AMAZING!!! Perfect for Ash Wednesday!!! Love it! This looks awesome! 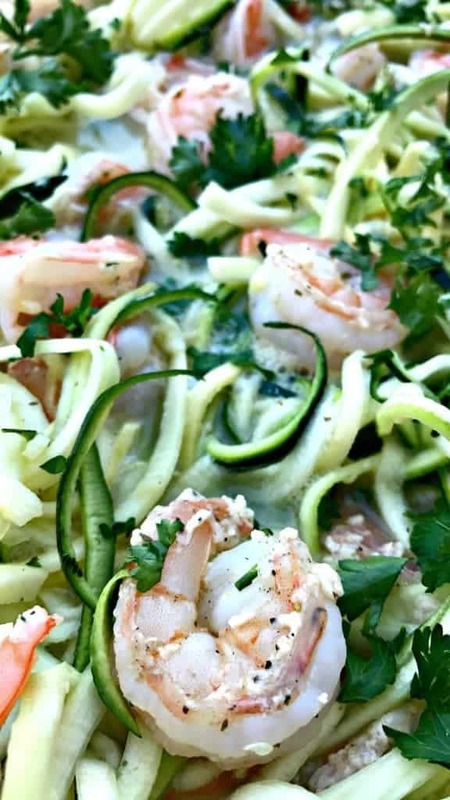 I have had zoodles and love them, so add shrimp and I bet it would be so delicious! Who doesn’t love a good shrimp scampi? I love your version with zucchini noodles! THIS CANNOT get in my mouth fast ENOUGH! Haha! You should make it! I made this recipe last night and it was truly delicious however it should be noted that the carb content is higher than 4g – more like 9g depending on how many pieces of shrimp are in your serving. This makes a huge difference if you’re trying to stay within 20g of carbs. I’m glad you enjoyed it! The carbs will vary for every recipe and are based on the branded ingredients each person uses. Everyone should calculate their personal macros using their branded ingredients. This is how I calculated mine that I provided as a courtesy. I also weigh my shrimp and input that into the calculator.